Happy Release Day Lexi Ryan! Something Reckless is Out Today! want something reckless. Heat. Passion. The thrill of being entirely possessed. and flirted, hid behind screen names and cartoon avatars. Now they’re breaking the rules and meeting in person. But Liz is prepared. She’s picked up hints and followed clues. identity of her dirty-talking online friend. chance at something real could crumble. To say that I eagerly anticipate a new release from Lexi Ryan is an understatement. I couldn’t wait for Liz and Sam’s story. I have become firmly entrenched in New Hope…it kind of reminds me of how I felt about Dawson’s Creek for the first few seasons…addicted…couldn’t get enough. Yes, that is definitely dating me and giving my age out to the masses but it was a good comparison. Back to New Hope and more importantly Sam and Liz. After reading the Here and Now Series, I felt there was more to Liz. She seemed to be labeled the pretty twin, not really smart, and everything was easy for her. We all know that is never the case…the grass is always greener on the other side. Believe me, I felt for Hannah (Liz’s twin) and loved the Here and Now Series but I couldn’t help but wonder what Lexi had in store for Liz. Liz is looking for love and she is trying online dating. She has always had a thing for Sam Bradshaw but they can’t seem to get on the same page in the relationship department. Not to mention, Liz makes another mistake that changes the dynamic of not only her friendship with Sam but others as well. She meets “River” online and secretly hopes it is Sam because they share an insane amount of chemistry. Sam Bradshaw doesn’t do strings and never makes any promises. He thought he and Liz may could try dating but it wasn’t in the cards. The problem for Sam is he can’t stay away from Liz. She has always been there for him but a little out of his reach…never fully trusting him. Liz believes she wants to engage in something reckless to take the edge of her life that seems to be on a downward spiral. Truthfully, she wants what her sister and best friends have…something real. A guy who cares about her, challenges her and she is passionate about. Because New Hope is a small town and everybody knows everybody, Liz and Sam are being manipulated by family and friends…everyone’s agenda is not in their best interests. The dynamics are not simple and they both are keeping secrets. Her past keeps jumping out the ruin what her and Sam could possibly have and they both are having a difficult time letting go and living in the here and now. The ending is a cliffhanger and honestly, I should have seen it coming but I was so caught up in this fast paced read, I didn’t have time to anticipate it! Lexi Ryan excels at crafting characters that you identify with and can’t help but love. I became totally invested in Sam and Liz. Getting to visit New Hope is like visiting home for me. This group of friends and family are easy to lose yourself in for hours. Can’t wait for the conclusion to Sam and Liz’s story. thumps out a beat, probably Morse code for please and thank you. I lift my chin and prop my hands on my hips. pretending our annual one-night stand is enough for me. “Tell me you aren’t going to run away in the morning. when I open under him because I’m helpless to this man’s kiss. his breath escapes him in a rush. right here at his feet. pass. Electric pleasure whips through me. “Fourteen months since I’ve touched you,” he says. his eyes. This promises to be SOMETHING WILD. or Twitter to chat about books, TV, and her children’s latest antics. 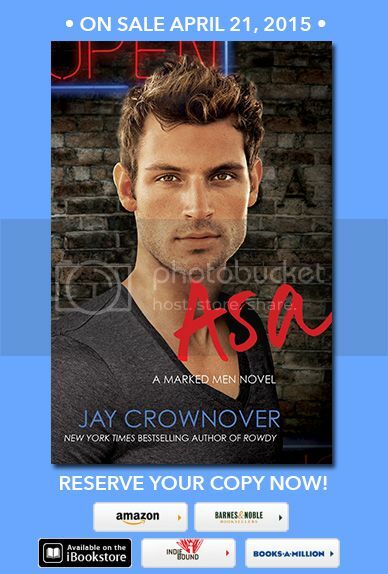 I am so excited about the cover reveal for Jay Crownover’s ASA! ASA is the sixth and final book in Jay’s Marked Men Series, published by HarperCollins. The Marked Men series is one of my all time favorite and this is the last of our beloved Marked Men. I have a feeling…he may end up being my favorite! Check out the hot cover and don’t forget to pre-order your copy today! I am so excited to be able to share with you Cora Carmack’s New Adult Paranormal Novel INSPIRE! There is nothing this lovely lady can not write about….go out and get this one today! I will be surprised if Ms. Carmack ever writes a book that I don’t enjoy. This was her first foray into New Adult Paranormal and INSPIRE didn’t disappoint. For all of us that love mythology, I loved that Cora picked the muses to delve into with Kalliope. Kalliope and her sisters live among the mortals inspiring artists to hone their crafts and be the best they can be; but her inspiration has a price. Kalli isn’t allowed to fall in love and stay in a relationship. Her inspiration in large doses can cause madness and destroy a person’s life. As I was reading I couldn’t help but feel sorry for Kalli. Yes, she is immortal, beautiful, easy to love and no “real world” worries but she lives her life as if it is the movie Groundhog Day except the faces change. Same story, same ending, different players. It would be sad to know that you start a relationship, watch the person become the best version of themselves, and then know you have to leave for fear of destroying a person. When Kalli decides she wants more, you don’t blame her one bit. Enter Wilder….Kalli thinks he is a safe bet. He is the opposite of her normal artist type. He wears a suit, has a responsible job and takes care of his mom and little sister. Wilder is easy on the eyes, smart, loyal to his friends and family and is easy to be around. He is everything a girl would want in a boyfriend but he is hiding parts of himself from Kalli just as she is hiding her true self from him. Their relationship develops quickly and they both fall for each other but do they really know each other?? I don’t want to give away what happens but the best way I can describe the ending….utterly shocked. I honestly didn’t see it coming. I love endings that trip up your heart and give you a moment’s pause and I am a true glutton for punishment…I love books with no endings…these series are my favorite. Especially when the ending is heart wrenching! If you enjoy new adult and paranormal, this is a must buy. Congrats, Cora! You knocked it out of the park with this one!